In the Time Settings dialog, you can specify the overall time duration (this is also the reason why the time scale is shown as a percentage). You can also specify the time offset. If the time offset is greater than 0, the time sequence will start after the specified number of seconds. Set the repeat count to repeat the series or click on Continuous to repeat it forever. 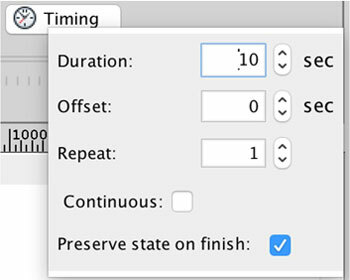 Tip: Use the “Continuous” option in combination with the tag triggered option “Stop when condition not valid” to play your time sequence continuously when your tag value is within the limits. When the time sequence finishes, it can either leave all graphical objects as they were at the end of the animation or it can set your objects to the initial state (e.g. set them as they were at the beginning of time sequence).